I've tried quite a few products from Ozeri now and I have been really impressed with all of them! I was very kindly sent the *Ozeri Ultra Thin Kitchen Scale ($17.49) which will come in so handy as my primary schools christmas fair is coming up this week and I am making lots of gingerbread men and spiced cake! The scale look so professional and sleek and as the name would suggest, it is really thin so it would be fantastic if you don't have that much storage as some kitchen scales can be so large and bulky! The scales are stainless steel, they measure in pounds, grams, kilograms and ounces and they come with two batteries. 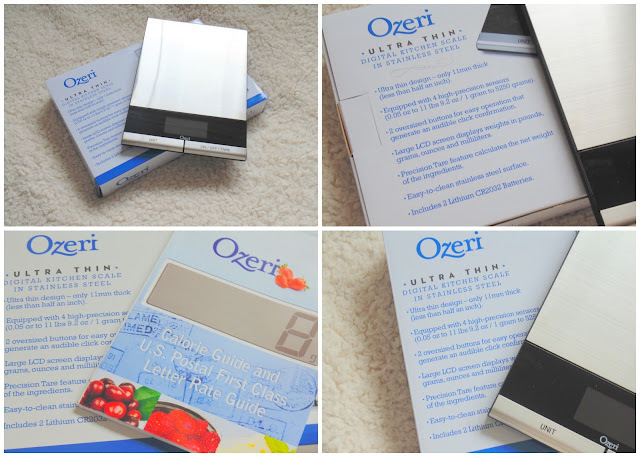 The scales also come with a calorie guide which came with the last set of Ozeri scales and I think it could come in useful as it states the calories for lots of food so if you are counting calories then it might be really handy for you. All of the Ozeri products I've tried have been really good quality, very durable and reliable. The scales quite lightweight too and they would make a great addition to a christmas baking hamper or for students who have just moved out and love baking/cooking. I would include the scales in a baking hamper along with baking ingredients, cooking tools and maybe a great british bake off book! Have you tried any products from Ozeri? Labels: Kitchen Scale, Ozeri, Ozeri Scale.